A new complex is for sale. It is including a three-storey hotel (living area - 1400 sq. 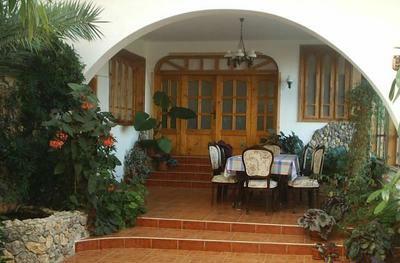 m), there are 2 apartments with 4 beds and 6 double rooms. There is also room for the porterr. Each room is equipped with separate toilet and bathroom, heating, telephone, satellite television and spacious terraces overlooking the sea resort of Albena. 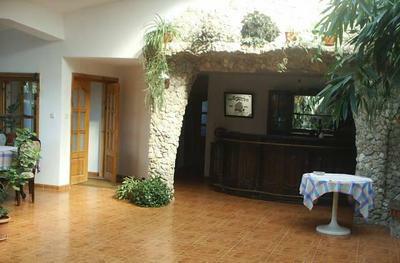 In the hotel part there is a totally furnished cozy restaurant with 30 seats, equipped with a unique bar and large fireplace. Close to the restaurant was made still room for games suitable for billiards, chess, games of cards or table tennis and others. The complex has a conference room for meetings or meetings of companies, organizations or citizens. For the convenience of guests are provided facilities for lekarsi office, gym and sauna bath with separate bathroom. A residential part is built beside hotel complex, which can be used as additional hotel facilities (1 house with 3 bedrooms, 2 baths, big living, office, a large terrace 29 square meters with a summer kitchen). The terrace - 29 square meters, has a panoramic view of the sea and the beautiful view of the resort of Albena. The property has a yard over 1200 sq. m. There is a large indoor garage for 2 cars and there is scope for internal parking for a further total of 10 cars. Part of the Park hotel complex is attractive and it is made by original architectural design (excellent arranged garden with ornamental trees, shrubs, flowers and fountain). Alleys are formed, orchard, kitchen garden and farm buildings have about 100 sq. m.
There are outdoor barbecue bar and two outdoor pools - for adults and children. Close to the property there is a beautiful forest. It was found, that the air here is very favourable for people suffering from asthma. This place is particularly suitable for the development of eco, alternative, hunting, marine and rural tourism.